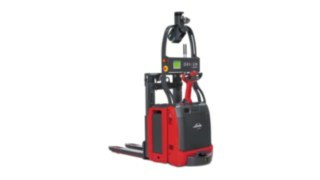 The autonomously controlled pallet truck Linde T-MATIC is designed for transport over long distances or for block stacking in preparation for dispatch. The model is designed to take loads of up to 3000 kilograms, and it can be used either alone or as part of an automated fleet. 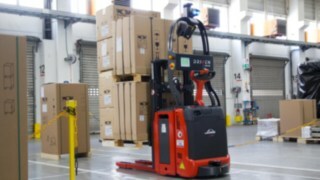 At any given time it is also possible to control the pallet truck manually. The truck’s navigational system does not require any additional installation of control technology, such as tracks on the floor or laser reflectors, but rather uses optical sensors to reliably react to any obstacles or other transport movements within its operational environment. 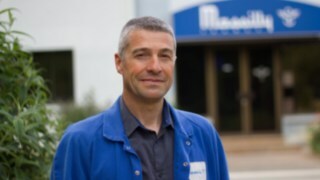 Thanks to innovative safety and navigation technology, the T-MATIC is also suitable for use in environments in which people and automated machines have to work together flexibly and in tight spaces. 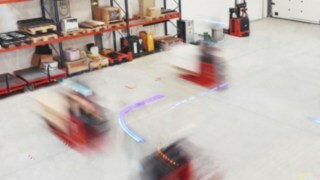 As an autonomous logistics truck, the Linde T-MATIC causes less damage to cargo and infrastructure. 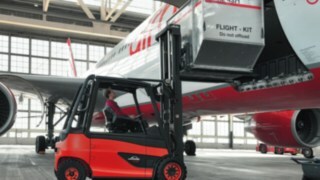 The optical sensors adjust the speed of the Linde low-platform pallet truck in real time. This allows the truck fleet to keep moving and remain optimally productive, while simultaneously increasing work safety. 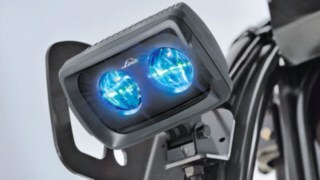 The safety features, based on laser optics and camera scanning, enable the recognition of people, other trucks, and obstacles and ensure that collisions are reliably avoided. Stop buttons for emergencies, as well as acoustic warning signals and flashing lights, round out the safety features of the T-MATIC. 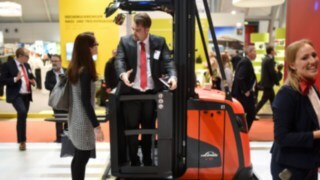 The T-MATIC low-platform pallet truck is designed to work alongside people in the immediate vicinity. Moreover, the T-MATIC can be easily switched from automatic to manual operation by grasping the hand drawbar. 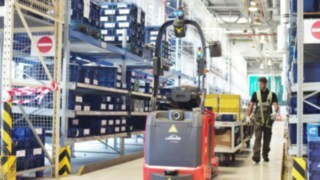 Whether as a single truck or as part of a fleet of automated robots, the T-MATIC is able to quickly adapt to changing on-site operating conditions. 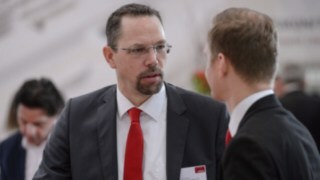 Communication with automated facilities, such as doors and roller conveyors, as well as with warehouse management or ERP systems is made possible by the supervisor software. This allows the T-MATIC to always travel at the greatest possible speed for maximum throughput. 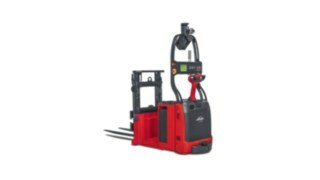 The electronic and mechanical components of the T-MATIC low-platform pallet truck are easily accessible, ensuring short shutdowns for maintenance and a high operational readiness over many years. The drive system’s maintenance-free three-phase technology contributes just as much to the truck’s high operational availability as the specially developed networking of the control electronics, which allow all of the T-MATIC’s data to be read and analyzed on a service laptop. It is also possible to set up a remote diagnostic system. The T-MATIC can be delivered with a two-dimensional curtain laser, which bolsters the scanning of the environment for safety reasons. The truck can be fitted with a barcode reader, allowing data from cargo to be scanned directly into a merchandise management system. Lane warning device Linde BlueSpot™ Enhances safety during operation as the LED spot makes the forklift noiselessly visible. 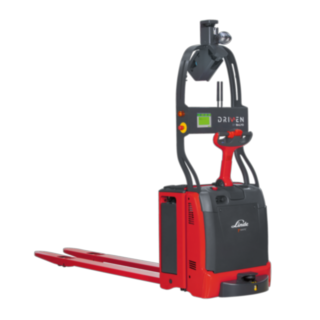 The T-MATIC low-platform pallet truck can also be powered by a gel battery. The truck can be delivered with the appropriate presets for this. 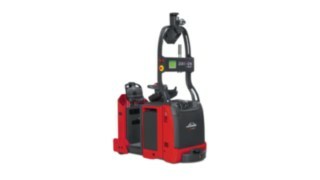 There is a three meter extension cord for the low-platform pallet truck, facilitating battery charging. The T-MATIC can optionally be fitted with an ancillary horn. 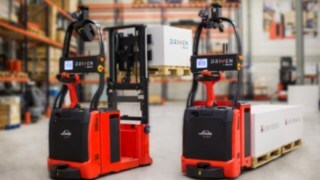 This ensures that the pallet stacker is able to be heard more easily in particularly noisy environments.